The 2019 Triathlon Training Log is now available. Due to popular demand I created a separate log in Kilometers in addition to Miles. Make sure you select the appropriate log before purchasing. You can read more about the logs at this link. To purchase the Triathlon Training Log, click here. ​There is a 10% discount available through the remainder of 2018, use code EARLYBIRD. ​Over the next month many of Tri-More-Fitness athletes will be competing at the 70.3 and 140.6 distance triathlons. Nutrition is always a topic of discussion leading up to a race so I thought I would compile a few tips for the race. Competing at these distances, nutrition is as much if not more of a factor than the training for each discipline. Having a nutritional plan is essential to race day performance. Tip #1: Start fueling for the race 48 hours prior. To set yourself up for a good race you have to start fueling your body at least 48 hours prior to race start. This doesn’t mean you change your diet, it is too late for that. You should go light on pasta and include protein in allmeals. Protein should outweigh refined grains, sweets and sugary drinks. In fact you should avoid sugary drinks all together, save it for race day. Try to eat your pre-race dinner 10 hours prior to your pre-race breakfast. Drink water when you are thirsty, do not try and “hydrate” drinking too much water. Tip #2: Finish pre-race breakfast 2.5 to 3 hours before race start. Breakfast should consist of protein, carbs and some fats, focus on a ratio of 1:2 for protein to carbs. If you have a sensitive GI system you still need to consume some calories. Your body is low on fuel after sleeping and you need to get some food particularly some sugars into your system. Tip #3: Don’t over hydrate prior to start.Leading up to the race start, sip water to quench off thirst, don’t drink to hydrate. Once you are within 10 minutes of the race, sip on fuel replacement drink or eat a gel. If you are a heavy sweater you may need a full bottle of fluids within 10 minutes of race start. Tip #4: Don’t eat in transition. After coming out of the water focus on the task at hand and get through transition as quickly as possible. Your heart rate is high coming out of the water and running through transition. Avoid an extra stress and just get through transition fast and smooth. Wait until you are on the bike and your heart rate begins to settle before you eat anything. This doesn’t mean you can’t drink water as soon as you are on the bike. Allow your system to settle before adding food and upsetting the GI system. This applies to both T1 and T2. Tip #5: Don’t try anything new. You should have a solid nutrition plan for the race. Follow the plan that you and your coach have developed. If you decide to try on course nutrition, make sure it is something that you have tried during training. The only exception to this is if your nutrition plan isn’t working. If your nutrition plan isn’t working try a few of the recommendations from “Long Course Nutrition: What’s Going Wrong”. You have trained long and hard. Use the knowledge you have gained through training and these tips to help you be successful on race day. Long Course Nutrition: What’s Going Wrong? ​We have several athletes within 10-weeks of their goal race, whether 70.3 or 140.6 distance. Now is the time to be practicing your race morning routine and race day nutrition during your long workouts. You need to figure out what is working during training. Although it is difficult to replicate race day nutrition during training, but it is a great place to start and then implement during a shorter race. We can have the best race day plan. We can follow it to a T. The plan may have even worked in the past. Things change each and every race and no two races are the same so expect the unexpected. You need to develop a plan for the unexpected and know the signs of when things may not be working quite right. If you have ever raced long course you probably have experience the mind starting to wonder, thoughts of “why am I doing this?”; “what were you thinking?”; “stop running, it is okay to walk.” If this begins to occur and you can’t get it under control using your normal methods, it may be a sign that you need immediate nutrition. Next time this happens, trying taking in something that will quickly satisfy the nutrition needs. Something that is quickly absorbed such as a gel, blocks, or even coke, anything that has a high sugar content. I know it is evil but during a long course triathlon I promise you, it is okay. Maybe you are on the other end of the spectrum and you are having GI issues with a bloated stomach. It could be that you are not absorbing the nutrients that you are consuming. I have been there and, in the moment, I thought I needed more calories. It was the wrong answer. What I really needed was to stop taking in more calories. I was dehydrated and my stomach slowed on breaking down the nutrients I was putting in. What I really needed was to stop taking in calories and slowly add water to help dilute the nutrients which will allow them to absorb into the body quicker. At the next aid station swish some coke around in your mouth and then spit it out and drink water. If you no longer enjoy the taste of your favorite nutritional product and you stop eating, try drinking some coke at the next aid station. It may help you enjoy the taste of your favorite product again. Next time you are on the course and things are not going according to plan, it may be time to try one of these methods. Nowadays everyone is using a GPS device with heart rate monitor (HRM) on both the bike and during the run. These are both fantastic tool for training and racing an provide motivation while your track your progress. They can also provide much discouragement when things don’t go quite right. You can track progress and maximize your training using these devices and if monitored daily the can help reduce the chance of injury and over training. The newer devices are providing more and more information to be analyzed, things such as cadence, stride length, vertical oscillation, and ground contact time. If you have a wrist mounted HRM, they can monitor sleep patterns and you can check your morning resting heart rate. Both sleep patterns and morning rest rate can provide invaluable data for you and your coach. In fact, most recently I started tracking both my total sleep time and total quality sleep time over the past three months using my apple watch. Although these snapshots can be deceiving looking without seeing the whole picture, as an example 9-hours of sleep on 7/21 does not equate to 9 hours of sleep. The sleep was broken were I was up 5 separate times ranging from 5 minutes to 30 minutes. Use it daily and ensure you wear your heart rate monitor for every workout. It helps your coach monitor your Heart Rate Variable Index as well as a more accurate Training Stress Score. Set up the basics on your watch; preferable have training zones set up that match your training zones in TrainingPeaks. Learn the features of your device. Learn one or two features every time you use it. Start with timer and lap button, then move to heart rate features and then if you your watch allows you to customize your screens, customize them. 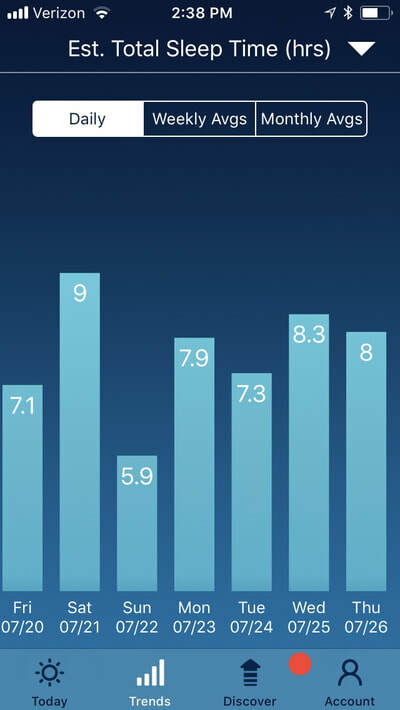 Learn your heart rate training zones in comparison to rate of perceived effort (RPE). Discuss with your coach on when to switch from HR workout to RPE or when things don’t seem to match. There are two methods on how to record your interval workouts. First create a workout that allows your watch to do the splits, not preferred for hill workouts and second manually record the workout. I will discuss the manual method. Start the timer when you start your workout to include the warm-up. Once you get to the start of your first interval, whether it is a hill, track workout, or even a tempo workout, press the lap button. Press the lap button again when you reach the end of the interval. Press lap button again when you start the next interval. A Variation for hill repeats is to add an addition press of the lap button to include the split for the descending portion of the workout. For all intervals, start easy and build into it. The first interval should be one of the slowest intervals of the set. Push a little hard on each interval. Regardless of the number of intervals that are on your training plan, stop the intervals when your form begins to fall apart. Repeatedly running with bad form will increase your chance of injury. Interval time or distance: How far or how long did it take? This data depends on whether the interval is time or distance based. Average pace or speed. How many intervals were complete before you started slowing down? Did you run/ride at a recovery effort during the rest period? This plays to how well you recover and able to complete each interval. Average heart rate: I compare your average heart rate for each interval as well as how quickly did it drop. It should get higher and take longer to drop after each workout. Max heart rate: What did it top out for each interval and max for entire workout? Did your heart rate stay within the parameters of the appropriate zone based on the type of workout? Comments you provide in TrainingPeaks. Especially any comments that helps me analyze the workout; such as weather, RPE, how you are feeling, resting heart rate, sleep, etc. All of these provide insight to why your heart rate might not normal. I also look at other data if it is available such as cadence, power, ground contact time, vertical oscillation, etc. At the end of the day, I am looking for improvements over time. Is your heart rate dropping at a given pace or is your pace faster at a given heart rate? All are indicators that you are gaining fitness. Ultimately, the more consistent information you can provide me the better I can analyze the numbers. Train smart and have fun out there and enjoy the process. So You Want to do an Ironman! ​Listening to a Podcast this morning got me thinking of the route that many triathletes take to complete an Ironman. I have coached many athletes to Ironman 70.3 and Ironman distance triathlons. Most have completed in the allotted amount of time and few have fallen short by a mile or two. Some due to unforeseen circumstances and other due to a lack of foundation and training. I would define a foundation, as training and racing at shorter distances to build strength and power. This will translate to a faster triathlon at the shorter distances and ultimately preparing you to go faster at the 70.3 or Ironman distance. I will teach you how your body reacts to extreme torture; what works best for you; how to train; what races would be best for you; etc. There are so many things you will learn about yourself during this journey. I have often thought that almost anyone can complete an Ironman distance race. As I look back over my career and many that I have coached I see a common theme for those that have been incredibly successful. Almost everyone, including myself, had years of training and racing at the Sprint and Olympic distances and all have had an athletic background of some sort. This doesn’t mean that you can’t complete an Ironman 70.3 or full Ironman with minimal training. All it means as that these athletes have a large foundation to build upon. I will use myself as a case study. I started running in the military. After about 10 years of military service I discovered that I enjoyed it and it was nothing for me to go do a 10-mile run for the fun of it. Eventually someone asked me to run a half-marathon. From there I was hooked and started doing marathons for the next 3-years. It took me 3-years to get to a point where I could run fast enough to qualify for Boston. It didn’t happen overnight, it took years to build my speed and endurance. After about 4-years of running marathons, I was told I needed to stop running. At that point I bought a bike to cross train and continued to run. At some point, a buddy talked me into doing a triathlon. With no training in the pool and no bike, I decided to join him for a sprint triathlon with a borrowed bike. I had an absolute blast even though I thought I was going to drown in the pool. Two years later, I bought a bike and did my first real triathlon with some training the following summer with little training in the pool and minimal on the bike. I was hooked. I spent the next 3-years doing local races at the Sprint and Olympic distances. I didn’t know it at the time, but this was when I developed my speed for Ironman 70.3 and Ironman distance races. I remember doing my first 70.3 distance race hoping I could finish the bike in 3-hours which works out to be 18.6 mph. I continued racing Sprint and Olympic distances bringing my speed up more. I got to the point that I was now racing the short distances at 22+ mph. 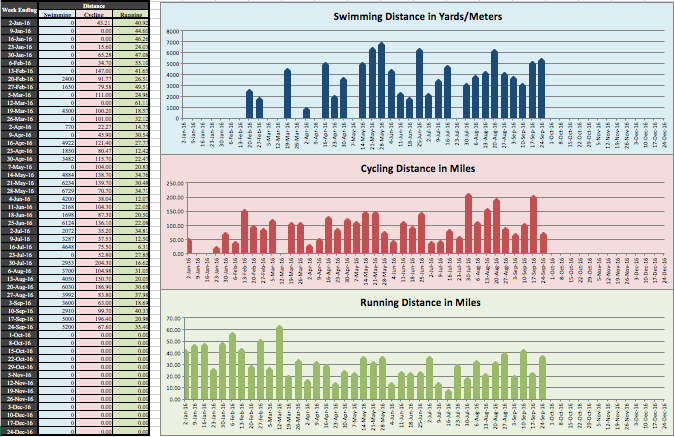 Which easily translated into 20+ for Ironman 70.3 and Ironman distance (pending weather and terrain). It took years of training to get that fast. I have a good friend that easily ran a 1:10 half marathon. When he started riding and training for triathlons he had no speed on the bike, yet he could run all his competitors down. Years later, he now rides at 21+ mph for an Ironman. The point is it took a coach and many Sprint and Olympic distance races to build his speed and endurance. If you are interested in completing an Ironman 70.3 or Ironman race, I would recommend you spend 3 to 4 seasons racing at the Sprint and Olympic distances. Take the $3,000 you would spend on an Ironman weekend and apply it toward a coach. Learn the sport, build speed and endurance first. Can you do it in 6-months with minimal experience? Absolutely. However, your experience will be a whole lot different and it won’t be as memorable as if you were to train up to it an learns the sport. I have found over the year with my own training that when I training on a daily basis rarely missing a workout, I seemed to perform much better. And now coaching athletes I see the same results over and over again. Those athletes that rarely miss a workout seem to perform with much better results race after race in compare to those that skip workouts on a regular basis. I understand that life gets in the way and it can be difficult to do every workout on the schedule week after week. It is not enough to do one or two intense workouts a week and expect to get faster, fitter, and stronger. It is the habitual workouts that you do day after day, week after week that will make you faster, fitter, and stronger both physically and mentally. 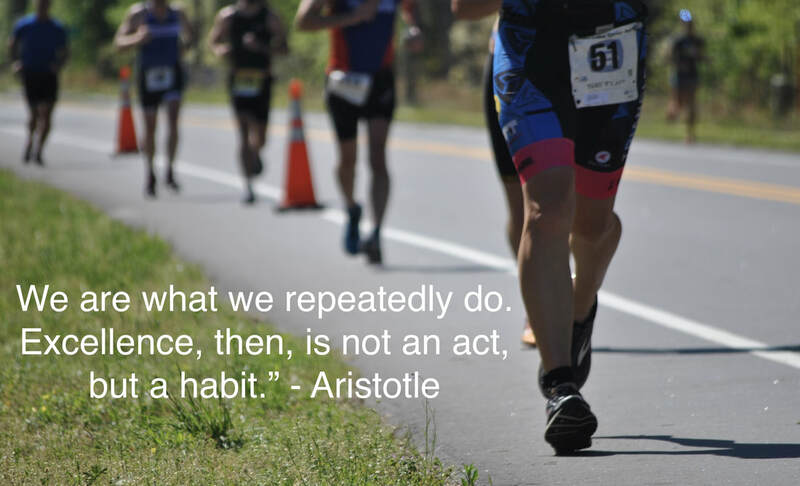 The quote from Aristotle is on point, that whatever we do repeatedly becomes our habits and we become very good at it. Whether it is training as an athlete or making excuses on why I can’t train today. If you have a desire to reach your goal, you will find a way to complete your training. Consistency is a decision that you must make; you have complete control over it. Here are four habits that will help you be more consistent with your workouts. 1. Plan your week: Your coach provides you with a training plan. That is not enough, review your plan the week prior and plan your training schedule on your calendar. When and where are you going to do your workouts. Write it down and make it a priority just like you would for a doctor appointment. 2. Set a goal: Set a goal to complete your workouts as prescribed. If your short on time, commit to completing a portion of the workout. Completing half the workout is better than skipping it all together. When I was marathon training, one of my goals that I made with myself was that no matter how bad I felt or how little desire I had to do the workout I was committed to do at least the first 20 minutes of the workout. Rarely did I not complete the workout. The hardest thing is getting out the door. A goal could be something as simple as completing 85% of the scheduled workouts per month. 3. Fueling your body: Your energy level has a huge factor on motivating yourself to get out the door. It is critical that you have a high-quality diet. Think of your body as a race car, the high-quality fuel you put in the better you perform. You want to get the most out of your body. I can always tell when I am eating poorly. 4. Recovery: Sleep is essential to recovery and if you don’t get enough your body isn’t able to recover properly which will lead to fatigue over time. Shoot for at least 7-hours of sleep. In addition to sleep, not over doing your workouts on recovery days or weeks will allow your body to recovery so you can perform better the following day or next cycle of training. The 2018 Tri-More-Fitness Triathlon Training Log is now available for download. You can track your distance for each of the three disciplines as well as track the mileage of up to six running shoes. The training log is in Microsoft Excel and automatically compiles all the data for you. Two new features for 2018. 1) is the ability to track mileage on up to six bikes just like you tracking running shoes. 2) I added the option to choose whether you are swimming in Yards or Meters to calculate the total distance swam in miles. Click here to purchase the 2018 Triathlon Training Log. Tri-More-Fitness athletes please contact me for a free version. ​First, not all tires are treated equally. Your choice of tires for you bike will greatly depend on your intent, where you train or race and your comfort level in changing a tire while on the road. There are options for high puncture resistance which will reduce the likelihood of getting a flat while riding to rolling resistance which will reduce the energy required to spin the bike down the road. Puncture resistant tires are typically used for training. They provide a more comfortable ride, durability and reduce the chances of getting a flat tire. The down side to this style of tire is they are typically heavier, takes more energy to ride and less aerodynamic. Essentially, they are a much slower tire. This style of tire is best to use for training rides or on rough roads that have lots of debris. If you are not comfortable changing a flat tire while out on the road this may be the best choice. Rolling Resistance tires are typically used for race day. They require less energy to ride at the same effort and typically provide more aerodynamics. The downside is they are a little more prone to a flat tire than training tires. This style of tire is best used for races or smooth roads with little debris. There are numerous tire sizes available on the market and your choice of tire size is widely based on the width of your rims. Current trend is a wider rim with the same size tire which creates a smoother and more aerodynamic ride. Tire pressure has been a big debate lately. Tires have a recommended tire pressure on the side of the tire. There was a time that I would pump my tires up to 110 PSI for every ride regardless of the conditions. Today, I change my pressure based on which wheels/tires I am riding and the conditions outside. There are many factors that should dictate the ideal tire pressure for you such as weather, rider weight, and tire width. The narrower the tire, the more pressure. It should also be noted that the higher the pressure the less likely to get a puncture and the tires will have less rolling resistance. However, you will feel every bump on the road. The wider the tire the less pressure and the more surface of the tire will be on the road surface providing a smoother ride along with the benefits of puncture resistance and low rolling resistance. Another debate is between clincher and tubular tires. Clincher’s clinch the side of the rim and the tube is separate. A tubular tire is glued to the rim and the tub is sewn inside of the tire. Both style of tires comes in various widths, puncture and rolling resistance as described above. Ease of Installation/Repair between clincher and tubulars. For years, I assumed that clinchers where easier to install and change than tubulars. After switching to tubulars for my race wheels I found it easy to install. However, I haven’t had to change a tire in a race situation yet so I can’t speak in that regards. It is recommended that during a race that you carry a razor blade to speed the process in removing the old tire. I have personally found the tubular tires to be more comfortable to ride than the clinchers. I would recommend different tires training verses races. Ideally put tires on the bike based on road conditions for both training and races. If you have rough roads with lots of debris, puncture resistant tires would be recommended and if on smooth roads switch to rolling resistant tires. As endurance athletes we will all experience physical fatigue and sometimes it is associated with mental fatigued as well. We have all been there, the alarm goes off at 4:30 a.m. and you hit snooze. Maybe you hit it two or three times. Maybe you even turn the alarm off and go back to sleep. When you get up you start your normal routine before your workout and you just don’t have the desire to get out the door and get started. You decide to skip the workout and justify by telling yourself you are tired and a rest day will not hurt. Let’s start by defining Physical and Mental Fatigue. Physical fatigue is the temporary inability of a muscle to maintain optimal physical performance, and the severity is more with intense physical exercise. Causes of physical fatigue can range from over training, poor sleep, unhealthy diet, thyroid and hormone imbalances, and the list can go on, but these are the main contributors. Mental fatigue is similar in nature except it deals with the temporary reduction of cognitive performance. You just not are thinking clearly. It can be manifested in reduced alertness, reaction time, and overall effectiveness of your decisions. The causes of mental fatigue are much the same as physical fatigue both of which are apparent to sub-optimal athletic performance. If you are dealing with fatigue on a daily basis, it is time to conduct an assessment. Are you missing or skipping workouts due to fatigue or do you have no desire to conduct your workout? Take a look at your daily routine, workout schedule, eating habits (which includes hydration), sleep cycle, etc. If you are true to yourself, you will be able to determine the cause of your fatigue unless it is a medical issue such as thyroid and lack of Vitamin D or Iron. If you can’t determine the cause, it may be time to see a doctor for a physical. Although there are many factors that can cause physical and mental fatigue, I am only going to discuss five of the most common for endurance athletes. Physical fatigue is the most common with many athletes that train too hard on a day to day basis. Most beginning athletes don’t realize that they are training too hard for their fitness level and will quickly lead to physical fatigue. It also may be due to performing at high intensity for even the most seasoned athletes. If you struggle to swim, bike, or run and perform at less than normal standards, but your alertness and concentration remain intact, you may be dealing with physical fatigue which is normal during end of each microcycle. If the fatigue continues for four days or more, you may be overtraining. It may be time for some rest. Overtraining, if not corrected will eventually lead to injury. Mental fatigue is due to the stress placed on the mind. It is hard enough to train for one sport, when training for a triathlon it can be a very daunting task trying to manage three disciplines, family, and work schedules, not to mention strength training. If an athlete is training for their first Ironman, it places much more stress on the mind and body. Due to the way men and women process information, women will have more issues with mental fatigue. Men typically compartmentalize everything into little boxes, whereas women everything is intertwined and every thought and issue is connected. I have seen athletes over do their schedules and quickly get overwhelmed with it all. I have seen athlete’s completely break down do to mental fatigue, lose interest in training and nothing could get them motivated to train consistently again. If mental fatigue is affecting your ability to train, it may be time to take a mental break from training. Every athlete should take a break from training after their primary race; at least from structured training. It may be time to take a look at the burdens you are carrying mentally that keep you from being present in the moment. It is easy for me as I place everything in a box and only open the box when needed. If you are juggling multiple tasks/burdens, remember you have a choice where you place your attention in that moment. Take a deep breath and enjoy the world around you and forget those worries inside your head and focus on the moment. Another common reason athletes lose interest and struggle with the mental aspect of training, they have no clear goal or purpose for training. It doesn’t have to be much, but there must be something to allow you to get up early, stay up late and sacrifice your time. If you are a veteran of the sport, I challenge you to reconnect with your purpose. Sleep deprivation or lack of sleep will drive an athlete to mental fatigue. Lack of sleep and mental fatigue will affect mood, motivation, judgment, situational awareness, and alertness. The lack of sleep will not affect your physical capability to perform. There is no direct link to affect cardiovascular responses to physical activity or muscle strength and endurance. However, time to physical exhaustion is shorter than the athletes perception of level of performance and endurance is distorted. Sleep deprivation can be caused by several factors such as less than 7 hours of sleep on a regular basis, an inconsistent sleep schedule regardless of amount of sleep, and traveling to different time zones will throw off your internal clock. If you are dealing with sleep deprivations there are several things you can do: ensure you get 7-9 hours of uninterrupted sleep per night; be as consistent as possible with sleep schedule; avoid evening exercise before bed; and avoid caffeine before bed. There are lots of studies on when to stop drinking caffeine before bed. My recommendation is no caffeine within 6-hours of your scheduled bed time. If caffeine is consumed within 6-hours, the athlete may not be aware of the effects on the sleep pattern. But each person is different on the way caffeine affects the body. Dehydration or chronic dehydration plays a huge role in fatigue and overall athletic performance. Exercise performance is impaired when an individual is dehydrated by as little as 2% of body weight. Losses in excess of 5% of body weight can decrease the capacity for work by about 30% (Armstrong et al. 1985; Craig and Cummings 1966; Maughan 1991; Sawka and Pandolf 1990). It doesn’t take a lot of time to get dehydrated and start to lose performance capability. To avoid all the technical jargon and causes for loss of performance, just know that dehydration will affect your performance and chronic dehydration can be deadly leading to heat exhaustion. When an athlete is suffering from chronic dehydration, typically they are unaware of their need for fluids and don’t get thirsty when they need to. Water makes up more than 80% of the blood volume. If you remove 5 - 10% of water from your blood stream your body will begin to breakdown both physically and mentally. Think of it in terms of a car that doesn’t have the appropriate amount of oil in it, the car will break down if not rectified immediately. You need to drink roughly 8 glasses of water per day to stay hydrated and if you exercise, the volume must increase based on the amount of sweat. A surprising sign of chronic dehydration is we confuse thirst for hunger and have a desire for sugary snack when our body is actually asking for fluids instead. Dehydration will lead to mental and physical fatigue. Eating habits can have a huge effect on athletic performance and could lead to both physical and mental fatigue. Inadequate calories and nutrients will impair even the most conditioned athletes. A proper diet and correct balance of energy and macronutrients will help the athlete have optimum performance. The bodies’ requirement for fuel varies based on an individual’s age, gender, body type and the sport. For the best advice on dietary requirements it is recommended to talk to a coach, dietitian or sports nutritionist. For optimal performance an athlete must include a diet that balances carbohydrates, proteins and fats. An athlete’s fuel primarily comes from carbohydrates and should receive most of their carbohydrates from health sources such as oatmeal, brown rice, fruits and vegetables. Protein is required to help repair muscle fibers broken down during training. Healthy protein choices include fish, chicken, lean beef, eggs and low fat dairy. I know the craze lately has been low or no fat products, but fat is required as part of a healthy diet. Fat provides energy, fat-soluble vitamins and essential fatty acids. However, remember to keep fat at a minimum. A good source of fat are lumens, almond butter and olive oil. Each of the above factors can be intertwined and one will affect the other. As an example, if you are dehydrated and you have a healthy diet, your muscles to include your brain, may not be getting the nutrients required for optimal performance. It is recommended to hire a coach that can see the signs of fatigue and willing to discuss them with you. A certified coach will develop a training plan that will help reduce the chances of physical fatigue. A coach will help alleviate the need for an athlete to develop a plan that is made up as they go along. Communication with your coach on how you are feeling and what struggles you are having are critical for them to help you achieve your goals. Your coach may not have all the answers, but they will have the resources and knowledge to assist you in diagnosing the problem. As an endurance athlete, active duty military, husband and father of two, I have been there and have experienced all of the above mentioned factors. It is not easy to balance training, work and family schedules. If you are married your family must come first and having your spouse to help you stay grounded definitely helps. They may not understand the training aspect, but they can see when things are not right and help you assess what is happening. Your physical and mental fatigue will affect your family and believe it or not, your spouse may be battling with similar issues. The 2017 Tri-More-Fitness Triathlon Training Log is now available for download. 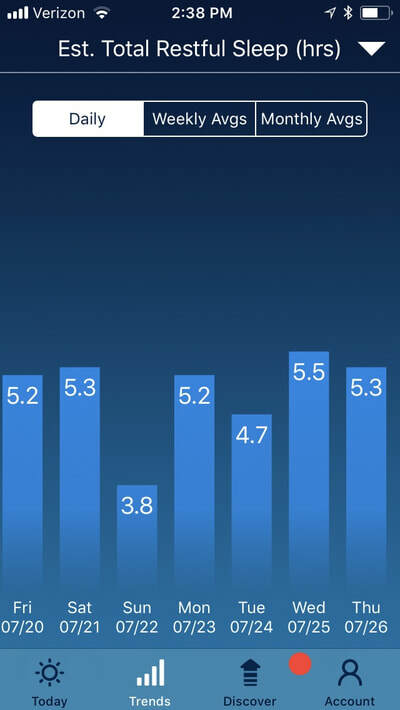 You can track your distance for each of the three disciplines as well as track the mileage of up to six running shoes. The training log is in Microsoft Excel and automatically compiles all the data for you. Each month has its own tab and all you have to do is input your distance, time, and any notes you want to write about your workout. Under the Running section to track your shoe mileage just type in the number corresponding with your shoe number under the running shoe tab. The spreadsheet will automatically track your mileage for each of your shoes. NOTE: ALL TIMES MUST BE IN hh:mm:ss FORMAT. Running shoe tracker. Just add an image of the shoe and purchase date. ​Click on the Weekly Charts tab and you can see each week in a snap shot of training. ​Or click on the Monthly Charts tab and it breaks down the data by both distance and time as well as shows a breakdown by percentage of time in each discipline. ​I have used a similar training log since 2005 and have kept and compare my training logs from time to time to see how things have changed. The training log that I use includes training zones for each discipline; from Anaerobic Threshold, Heart Rate Reserve, and running pace zones to Functional Threshold Power, Power Profile and Race Zones on the bike. This additional data requires additional testing and is a bit more complex. You can download a sample 2016 Triathlon Training Log for free or purchase the complete log at under the team store. I have been competing in Marathons since 2003 and triathlons since 2005.